Fake Communist poster, circa 1932. 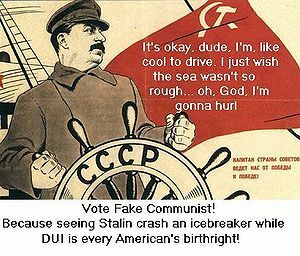 The Fake Communist Party (also known as the Communist Party of the United States of America (Not Really) abbreviated to CPUSA(NR)) is an American political party. It was founded in 1890 by a pretend cadre of fake communists, lead by Gunter "Vive la Faux Revolution" Dupree and Walter "How Do You Spell Che?" O'Malley. The party's platform is nominally based on Marxist doctrine, but was actually copied from "The Wind in the Willows" by Kenneth Graham. The party has never been particularly successful in American politics, with William McKinley being the only US President to come from its ranks. Opinion is divided on why the CPUSA(NR) has had so little success, with most analysts saying that the problem lies in the inherent stupidity of the idea; and the CPUSA(NR) themselves not really seeing it that way. 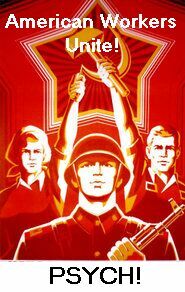 A typical Fake Communist poster from the 1960s, illustrating the party's lack of clear ideological focus or a clue. UTM: I think the first question that comes to mind when people think of the Fake Communist Party is: "just what the hell is the deal, there?" Wilkins: It's basically a very, very cunning ruse. By pretending to be Communists, we get the red vote. But by not being real Communists, we don't alienate non-Communist voters. UTM: Historically, communism hasn't been a popular movement in the United States. The "red vote", as you put it, is negligable. On the other hand, your vaguely defined real platform, your frequent use of Socialist Realist imagery and your candidates' repeated claims that the "streets will run red with the blood of the borgousiette (sic)" clearly alienates many voters. Do you think that this has contributed to your appauling lack of success? Wilkins: (long pause) Am I president yet? 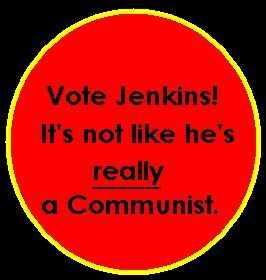 Election badge for Fake Communist Micah "Er, Engels or something" Jenkins, 1980. Jenkins claimed to win over eleventy billion "fake votes", but was nonetheless denied victory. A member of House Unamerican Affairs Committee and House of Waffles. Senator Flannel frequently infuriated other HUAC members by asking suspected Communists questions that were deemd "irrelevant". Senator Flannel's explanation that he was "researching his role" was not considered a legitimate reason for wasting the committee's time. This lead to frequent altercations with Joseph McCarthy, which often degenerated into Flannel loudly trying to explain Stanislavskian method acting to an infuriated McCarthy. Flannel quit HUAC and the Senate in 1954, shouting "I just can't work under these conditions" as he stormed off in a huff. Unsuccessful candidate for Governor of Texas in 1976. Her principle opponant, Sheldon C. Cowshagga, ran a negative campaign against her, calling her the "Red Lady", which confused McGuffin who was under the mistaken impression that the Communist colour is blue. Realising that running against her on an anti-Communist platform couldn't work given her present state of ignorance, Cowshagga had her kidnapped and shipped to a Communist "re-education centre" in Cambodia. She was soon brainwashed into being a loyal member of the Khmer Rouge, whereupon she was shipped back to Texas, and Cowshagga's inevitable victory. To add insult to injury, she was ejected from the CPUSA(NR) for "confusing everyone by talking funny about the workers, and stuff". This page was last edited on 10 September 2012, at 05:33.